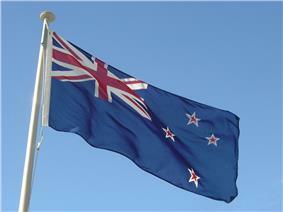 The flag of New Zealand is a defaced Blue Ensign with the Union Flag in the canton, and four red stars with white borders to the right. The stars' pattern represents the asterism within the constellation of Crux, the Southern Cross. New Zealand's first flag, the flag of the debate about changing the flag. A two-stage binding referendum on a flag change is planned to take place in 2015 and 2016. Out of 10,292 suggestions, the Flag Consideration Panel chose 40 designs, which have been reduced to five for the first referendum. 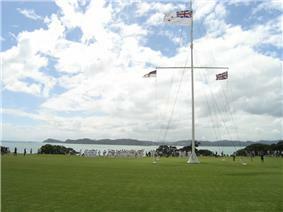 The flag pole at Waitangi, flying (left – right) the Flag of the United Tribes of New Zealand, the Ensign of the Royal New Zealand Navy and the Union Flag, 5 February 2006. The need for a flag of New Zealand first became clear when the Hokianga, was seized by Customs officials in the port of Sydney. The ship had been sailing without a flag, a violation of British navigation laws. New Zealand was not a colony at the time and had no flag. Among the passengers on the ship were two high-ranking Māori chiefs, believed to be Patuone and Taonui. The ship's detention was reported as arousing indignation among the Māori population. Unless a flag was selected, ships could continue to be seized. The first flag of New Zealand was adopted 9 (or 20) March 1834 by a vote made by the White Ensign, which was the flag used by Henry Williams on the Church Missionary Society ships. This flag became known as the flag of the United Tribes of New Zealand and was officially gazetted in New South Wales in August 1835, with a general description not mentioning fimbriation or the number of points on the stars. The need for a flag was pressing, not only because New Zealand-built ships were being impounded in Sydney for not flying a national flag, but also as a symbol of the independence declared by the Māori chiefs. The flag is still flown on the flag pole at Waitangi, and can be seen on Waitangi Day. Proposed flag not adopted by Māori; it included the Union Flag and lacked sufficient red. After the signing of the Treaty of Waitangi, the British Union Flag was used, although the former United Tribes flag was still used by a number of ships from New Zealand and in many cases on land. The New Zealand Company settlement at Wellington, for example, continued to use the United Tribes flag until ordered to replace it by Governor William Hobson in May 1840 (following his declaration of British sovereignty). In 1869 the First Lieutenant of the Royal Navy vessel Governor of New Zealand, for a national ensign for New Zealand. His proposal, incorporating the Southern Cross, was approved. It was initially used only on government ships, but was adopted as the de facto national flag in a surge of patriotism arising from the Second Boer War in 1902. To end confusion between various designs of the flag, the Liberal Government passed the Ensign and Code Signals Bill, which was approved by King Edward VII on 24 March 1902, declaring the flag as New Zealand's national flag. The United Tribes flag design also features on the back of the Second Boer War medals presented to soldiers who served in the war, which indicates that the United Tribes flag was used widely in New Zealand until around this time. One of the first recorded accounts of the New Zealand national Blue Ensign flag being flown in battle was at Quinn's Post, Gallipoli, in 1915. The flag was brought back to New Zealand by Private John Taylor, Canterbury Battalion.The first time the Flag of New Zealand was flown in a naval battle was from the HMS Achilles during the Battle of the River Plate in 1939. The national flag is defined in legislation as "the symbol of the Realm, Government, and people of New Zealand" and like most other laws, can be changed by a simple majority in Parliament. The flag proportion is 1:2 and the colours are red (Pantone 186C), blue (Pantone 280C) and white. Debate on keeping or changing the New Zealand flag started before May 1973, when a remit to change the flag was voted down by the Labour Party at their national conference. In November 1979 Minister of Internal Affairs Allan Highet suggested that the design of the flag should be changed, and sought an artist to design a new flag with a silver fern on the fly, but the proposal attracted little support. In 1998 Prime Minister Jenny Shipley backed Cultural Affairs Minister Marie Hasler's call for the flag to be changed. Shipley, along with the New Zealand Tourism Board, backed the quasi-national silver fern flag, using a white silver fern on a black background as a possible alternative flag, along the lines of the Canadian Maple Leaf flag. On 5 August 2010 Labour list MP Charles Chauvel introduced a member's bill for a consultative commission followed by a referendum on the New Zealand flag. On 11 March 2014, Prime Minister John Key announced in a speech his intention to hold a referendum, during the next parliamentary term, on adopting a new flag. Following National's re-election the details of the two referendums were announced. The first referendum is set for November 2015 allowing voters to decide on a preferred design from five choices. The second referendum will see the preferred design voted on against the current flag in March 2016. Under the New Zealand Flag Referendums Bill, in the event that the flag were to change, the current flag (described as the "1902 flag") of New Zealand may continue to be used, and is "recognised as a flag of historical significance." Official documents depicting the current flag, such as driver licences, would continue to be valid and would be replaced through matter of course (e.g. driver licence renewals). The New Zealand flag was the first national flag to incorporate the stars of the Southern Cross constellation, and remains distinctive as the only national flag that includes only those stars from the constellation that actually form the cross itself. The Australian flag adopted in 1901 also has the Union Flag in the canton and the Southern Cross on the fly. The cross on the New Zealand flag is composed of the four prime stars of the Southern Cross constellation, each being a red five pointed star with a white outline. The Australian flag has six white stars, five of which have seven points (the Commonwealth Star) and a five pointed star, Epsilon Crucis, the smaller star of the Southern Cross constellation which does not form part of the actual cross itself is also included. Australia's flag features a large Commonwealth Star below the Union Flag as it is a symbol of Australia. Many other flags also contain the Southern Cross, some as far back as the 1823/24 National Colonial Flag for Australia. This gallery presents other flags of New Zealand. ^a As a vehicle flag, the flag of New Zealand is authorized to be used by the Prime Minister, Government Ministers, Ambassadors, High Commissioners, and Consuls-General. No defacement of the flag is done in any of these cases. ^ a b "Flags". Ministry for Culture and Heritage (New Zealand). 23 July 2010. Retrieved 2011-09-06. ^ "Gallery of flags for the referendum". Govt.nz. New Zealand Government. 11 May 2015. Retrieved 11 August 2015. ^ "New Zealand unveils flag finalists, to mixed reviews". bbc.com. BBC. 1 September 2015. Retrieved 22 September 2015. ^ "United Tribes flag". NZHistory. Ministry of Culture and Heritage. 19 November 2010. Retrieved 2010-08-26. ^ "Flags of New Zealand: United Tribes flag". NZHistory. ^ a b Whitmore, Robbie (2006). "The colonisation of New Zealand". New Zealand in History. Retrieved 2010-12-28. ^ Simpson, K. A. "Hobson, William – Biography". 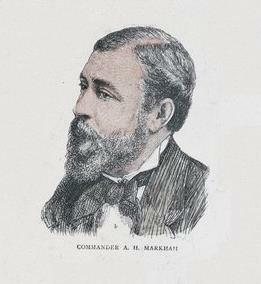 ^ , Norfolk Museums and Archeology Service"Rear-Admiral Sir Albert Hastings Markham". Archived from the original on 2008-06-02. Retrieved 2008-11-18. ^ "South African War medal". ^ "New Zealand flag from Quinn's Post | NZHistory, New Zealand history online". www.nzhistory.net.nz. Retrieved 2015-09-26. ^ "The "Diggers' " flag, the New Zealand Ensign, flying at the masthead of Achills during the naval battle" LXXI (46). Auckland Star. 23 February 1940. p. Page 9. Retrieved 3 November 2014. ^ Flags, Emblems, and Names Protection Act 1981, s 5(2). ^ "History of Republicanism in New Zealand – 1994". ^ "Maori Law Review – New Zealand". Maori Law Review. September 1994. ^ Moody, John. "Past Attempts to Change New Zealand's Flag" (pdf). ^ "New Zealand – Proposals for a new flag". ^ "Bill advocates consultative debate on new flag". ^ "New Zealand to hold referendum on new, ‘post-colonial’ flag". The Guardian. 11 March 2014. Retrieved 11 March 2014. ^ "The NZ flag — your chance to decide". Government of New Zealand. Retrieved 1 November 2015. ^ a b "New Zealand Flag Referendums Bill - amendments". ^ "The National Maori Flag". ^ "Government Notice, Colonial Secretary's Office. Sept. 9, 1835, New Zealand". The Cornwall Chronicle (Launceston, Tasmania). 1835-09-09. Retrieved 2014-06-15.
a 2003 paper on New Zealand flag changes by John Moody, Secretary of the New Zealand Flag Association.